Dr John May joins the NextMove Software team coming from the European Bioinformatics Institute (EBI), Hinxton, UK. Congratulations to Dr Daniel Lowe for being awarded a Blue Obelisk for his contributions to Open Data, Open Standards and Open Source, specifically OPSIN. All three software engineers at NextMove Software now have blue obelisks! 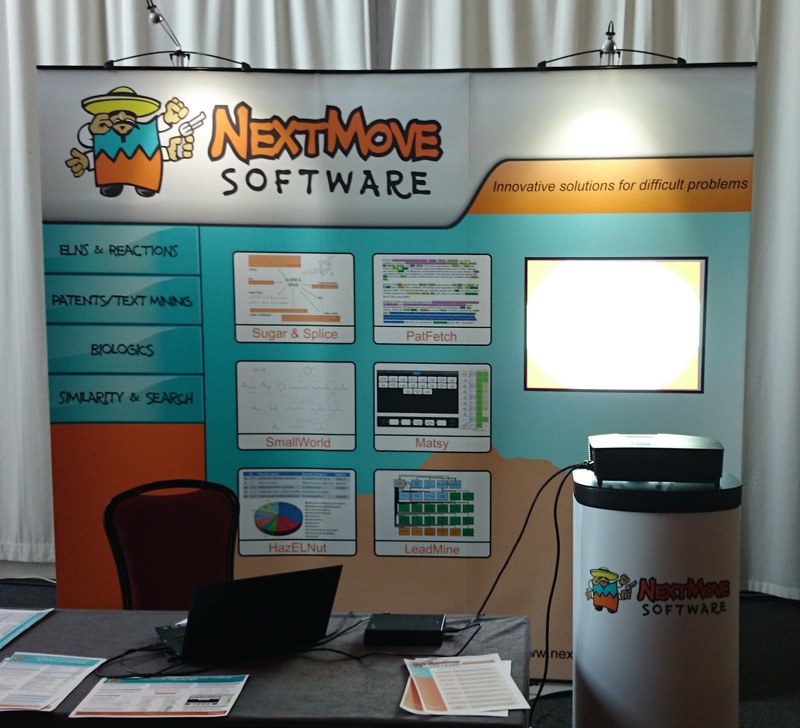 NextMove Software has our first ever exposition booth at the 10th International Conference on Chemical Structures (ICCS) and the 10th German Conference on Cheminformatics (GCC) in Noordwijkerhout, The Netherlands. The ICCS/GCC conference also provides a dry-run for our first American Chemical Society (ACS) National Meeting exposition booth at the Moscone Center, San Francisco in August 2014. NextMove Software announce another record financial year. A description of NextMove Software's latest product Matsy is published in the Journal of Medicinal Chemistry as Using Matched Molecular Series as a Predictive Tool to Optimize Biological Activity. Many thanks to our co-authors and collaborators Jonas Boström and Adrian Gill at AstraZeneca in Mölndal, Sweden for helping fund its research and development. Congratulations to Daniel Lowe, product manager and developer of NextMove Software's LeadMine software that performed impressively at the BioCreative IV CHEMNDER (Chemical compound and Named Drug Entity Recognition) challenge. Of the 27 teams that submitted results, NextMove was the highest ranked of the commercial and publically available systems, comming in third place, only 0.53% behind the best performing (proprietary in-house) system. GSK's Socrates Search project for chemically aware enterprise search wins the 2013 BioIT World Best Practices Award for knowledge management showcasing the use of both NextMove Software's LeadMine and HazELNut products, in conjunction with HP Autonomy and ChemAxon's JChem Cartridge. Congratulations to Andrew Wooster and his team. Mick Kappler from Hoffmann-La Roche presents "Intuitive and Integrated Browsing of Reactions, Structures and Citations: The Roche Experience" at the Spring 2013 ACS Meeting in New Orleans, describing the use of NextMove Software's HazELNut to export reactions from the CambridgeSoft/PKI ELN and search them using Elsevier's Reaxys. Dr Noel O'Boyle joins the NextMove Software team coming from University College Cork, Ireland. The first peer-reviewed article describing the use of NextMove Software's HazELNut product appears in the ACS Journal of Chemical Information and Modeling. NextMove Software announces the release of its latest product, HazELNut, at the Spring 2012 National Meeting of the American Chemical Society in San Diego, California. Daniel Lowe, formerly at the Unilever Centre for Molecular Informatics, Department of Chemistry, University of Cambridge, joins the NextMove Software team. A paper describing NextMove Software's CaffeineFix and LeadMine products, entitled "Improved Chemical Text Mining of Patents with Infinite Dictionaries and Automatic Spelling Correction", appears on the ACS Journal of Chemical Information and Modeling's Article ASAP web site. NextMove Software Limited is established in the United Kingdom. The new corporate offices are at the Innovation Centre (Unit 23), Cambridge Science Park, Milton Road, Cambridge CB4 0EY. Roger Sayle is delighted and honored to be presented a Blue Obelisk award by Peter Murray-Rust at the ACS Spring National Meeting in Anaheim, California, for his contributions to Open Source software including RasMol and OpenBabel. My thanks to PMR and the community. NextMove Software has moved. Our new business address is 551 West Cordova Road #32, Santa Fe, New Mexico. The telephone and FAX numbers remain the same. Mail to our old address at 1303 Bartlet Court should get forwarded automatically during the transition. The paper "Foreign Language Translation of Chemical Nomenclature by Computer" is officially the most downloaded article from the American Chemical Society's Journal of Chemical Information and Modeling during 2009. NextMove Software and AstraZeneca to present on "Improved Chemical Text Mining of Patents" (CaffeineFix) at the German Chemoinformatics Conference (GCC) in Goslar in November. Perspectives article "So You Think You Understand Tautomerism?" appears in the June-July issue of the Journal of Computer-Aided Molecular Design (JCAMD). NextMove Software launches its shiny new web site. NextMove Software announces the release of its first product, CaffeineFix, at the Spring 2010 National Meeting of the American Chemical Society in San Francisco, California.